“giving life to flowers” and “arranging flowers”. style of flower arranging, in Ikebana more plants and branches are used. relaxation for the mind, body and soul. still exist and is a leading school of Ikebana in Japan. of Bonsai creating a miniature landscape on a tray. and plants were arranged in an upright position. It is very decorative. 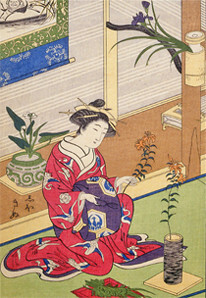 In the late 17th century, a new style, Shouka appeared. This style simplified the rules of the Rikka style. "mankind" to express harmony between man and nature.